Literary Chinese (Vietnamese: cổ văn 古文 or văn ngôn 文言) was the medium of all formal writing in Vietnam for almost all of the history of the country up to the early 20th century, when it was replaced by vernacular writing using the Latin-based Vietnamese alphabet. The language was the same as that used in China itself, as well as Korea and Japan, and used the same standard Chinese characters. 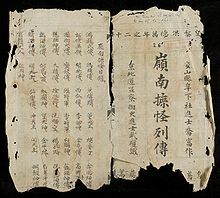 It was used for official business, historical annals, fiction, verse, scholarship and even for declarations of Vietnamese determination to resist the Chinese. Literary Chinese was a style of writing modelled on the classics of Warring States period and Han dynasty, such as the Mencius, the Commentary of Zuo and Sima Qian's Historical Records. It remained largely static while the various varieties of Chinese evolved and diverged to the point of mutual unintelligibility. The language was also used for formal writing in Vietnam, Korea and Japan, enabling scholars from these countries, as well as China, to communicate in writing, in a role similar to that of Latin in Europe. Literary Chinese as written in Vietnam used the same characters and outward form as in China. Although Literary Chinese was used only for written communication, each Chinese character could be read aloud in a Vietnamese approximation of the Middle Chinese pronunciation. For example, the term for Chinese characters, 漢字 (Hànzì in Modern Standard Chinese) has a Sino-Vietnamese reading of Hán tự. With these pronunciations, Chinese words were imported wholesale into the Vietnamese language. The resulting Sino-Vietnamese vocabulary makes up over half the Vietnamese lexicon. The Vietnamese terms for writing in Chinese are chữ Hán ("Chinese writing") or chữ nho ("Confucian writing") in contrast to chữ Nôm ("Southern writing"), a script for the Vietnamese language. The Nôm script, using a mixture of Chinese characters and locally created characters, became the vehicle for a flourishing vernacular literature, peaking in the late 18th and early 19th centuries. However Literary Chinese remained the medium of scholarship and administration for almost all of the period up to the early 20th century. The northern part of Vietnam (down to about the 17th parallel) was incorporated into the Han empire in 111 BC, beginning a millennium of Chinese control, interrupted only by two short-lived revolts. At first the empire sought to rule their new possession indirectly through the Vietnamese nobility, but after an influx of refugees fleeing the takeover of Wang Mang (9–23 AD), policy shifted to assimilation, contributing to the revolt of the Trung sisters (39–43). After the suppression of the revolt, Chinese authorities stepped up assimilation, destroying the estates of Vietnamese nobles, but also opening Chinese education to the Vietnamese. A few rose through the civil service to senior positions in the province and elsewhere in the empire. As in any other part of the empire, the administrative language of Vietnam was Chinese. However no writing in Chinese by a Vietnamese author has survived from this period. After the country achieved independence in 938, it continued to use Literary Chinese. At first Buddhist monks dominated government and scholarship in the country. The earliest extant writings by Vietnamese authors are poems from the late 10th century, in Chinese, by the Buddhist monks Lac Thuan and Khuông Việt. After three short-lived dynasties, the Ly Dynasty (1009–1225) was established with the support of Buddhist clergy. When the first king moved the capital to Hanoi in the following year, he issued the 110-character Edict on the Transfer of the Capital. Confucian influence grew over the course of the dynasty, with a Confucian Temple of Literature being erected in the capital in 1070. Civil service examinations on the Chinese model began in 1075, and in the following year a college was established for training sons of the ruling elite in the Confucian classics. an Address to the Army at the time of an attempted invasion by the Qing empire in 1789. The influence of Confucian literati grew in the following Tran Dynasty (1225–1400) until they had a monopoly on public office. The first official history, the Annals of Đại Việt (1272), was commissioned during this dynasty. Although this work has been lost, it served as a model for later annals, and parts of it are preserved in later annals written in Chinese, the Abbreviated Annals of Đại Việt (late 14th century) and the Complete Annals of Đại Việt (1479). Unofficial histories from this period include the Spirits of the Departed in the Viet Realm and the Wondrous Tales of Linh Nam, parts of which were also incorporated into the Complete Annals. The Vietnamese nationalist Phan Boi Chau (1867–1940) wrote in Literary Chinese. Literary Chinese remained the language of administration throughout the traditional period, except during two short-lived reformist regimes. When Hồ Quý Ly seized the throne in 1400, as well as pursuing a programme of land reform, he sought to break the power of the Confucian literati by making Vietnamese, written in the Nôm script, the state language and translating the classics to make them available to all. Hồ's reforms were reversed after Ming China invaded the country. None of the Nôm literature of the period has survived, through a combination of the Ming destruction of Vietnamese libraries and the continued prestige of Chinese works after the Ming were driven out. Similar reforms were attempted by Nguyễn Huệ from 1788, but were again reversed at the beginning of the succeeding Nguyen Dynasty (1802–1945). The shared written language made it possible for Vietnamese scholars to communicate with literate Chinese and Koreans, but only in writing; they required interpreters for verbal communication. The Vietnamese sent their best scholars as envoys to the Chinese capital, where they were to purchase the latest Chinese books and to enter poetry-writing competitions with Chinese and Korean scholars. The 18th-century triumph of Lê Quý Đôn in such a competition became a focus of national pride. Lê Quý Đôn is considered the last great author of Chinese literature in Vietnam. His prodigious output included a history of Vietnam, collected essays on a wide variety of topics, anthologies of verse and commentaries on the classics. Vietnamese intellectuals continued to write in Chinese up to the early decades of the 20th century. For example, the nationalist Phan Boi Chau (1867–1940) wrote his History of the Loss of Vietnam (1905) and other tracts in Literary Chinese, and also used it to communicate when in Japan and China, as he spoke neither Japanese nor Chinese. Writers such as Phan Boi Chau, Phan Chau Trinh and the principal of the Tonkin Free School even used Chinese to write their attacks on education in Chinese and the examination system. On the other side, the French colonial authorities were also opposed to Chinese, both because it made administration more difficult for them and because of the nationalist literature being circulated in the language. They abolished the examination system in 1913, and both Literary Chinese and Chữ nôm were swiftly replaced by the Latin-based Vietnamese alphabet in the early 20th century. In modern Vietnam, Chinese characters are seen only singly or in stock phrases written by calligraphers. ^ Nguyễn, Tri Tài (2002). Giáo trình tiếng Hán. Tập I: Cơ sở. Nhà xuất bản Đại học Quốc gia Thành phố Hồ Chí Minh. p. 5. ^ Norman (1988), p. 83. ^ a b Kornicki (2011), p. 67. ^ a b DeFrancis (1977), p. 16. ^ Alves (2009), p. 623. ^ DeFrancis (1977), pp. 26–27. ^ DeFrancis (1977), pp. 31–32, 40–44. ^ DeFrancis (1977), p. 3. ^ DeFrancis (1977), p. 10. ^ DeFrancis (1977), p. 12. ^ a b c DeFrancis (1977), p. 14. ^ Coedès (1966), p. 87. ^ DeFrancis (1977), p. 16, 18. ^ Taylor (1983), pp. 350–359. ^ Taylor (1983), pp. 352–357. ^ DeFrancis (1977), pp. 31–32. ^ DeFrancis (1977), pp. 40–44. ^ DeFrancis (1977), p. 35. ^ Woodside (1971), pp. 114–115. ^ DeFrancis (1977), p. 36. ^ DeFrancis (1977), p. 178. ^ DeFrancis (1977), pp. 178–179. ^ Hannas (1997), pp. 84–90. Alves, Mark J. (2009), "Loanwords in Vietnamese", in Haspelmath, Martin; Tadmor, Uri (eds. ), Loanwords in the World's Languages: A Comparative Handbook, De Gruyter, pp. 617–637, ISBN 978-3-11-021843-5. Coedès, George (1966), The Making of South East Asia, translated by H.M. Wright, University of California Press, ISBN 978-0-520-05061-7. Nguyen, Dinh-Hoa (1981), "Patriotism in classical Vietnamese literature: evolution of a theme", in Tham, Seong Chee (ed. ), Literature and Society in Southeast Asia, NUS Press, pp. 303–320, ISBN 978-9971-690-36-6. Taylor, Keith Weller (1983), The Birth of Vietnam, University of California Press, ISBN 978-0-520-07417-0. Woodside, Alexander (1971), Vietnam and the Chinese Model, Harvard Univ Asia Center, ISBN 978-0-674-93721-5. This page was last edited on 22 February 2019, at 18:50 (UTC).